When you see our hot table, you'll be amazed! Known throughout the Hawaiian Islands for its wide assortment of culinary delights, our hot table offers a diverse variety of prepared entrées. Our hot table is so varied and mouth-watering, you have to see it to believe it! Enjoy vegetarian versions of all-time classic favorites from American, Mexican, Indian, Italian, and Chinese cooking and other cuisines. Popular dishes include enchiladas, lasagna, eggplant parmesan and stuffed shells Italiano! Other favorites include our tasty roasted veggies, curry fried rice, red Thai curry, spanakopita, and Bombay spinach & tofu. We also offer a variety of delicious soups, such as split pea, vegetarian chili, and broccoli cashew, and more! You'll also find a hot bakery case filled with an assortment of delicious, freshly made pizza slices and calzones, including gluten- and dairy-free options! Try our freshly made pesto pizza, Hawaiian pizza with pineapple and veggies, Greek pizza, and more. Choose from delicious vegan eggplant tofu Managua calzones, Italian or Mediterranean, spinach feta or any of the wide variety of calzones we have to suit your tastes! 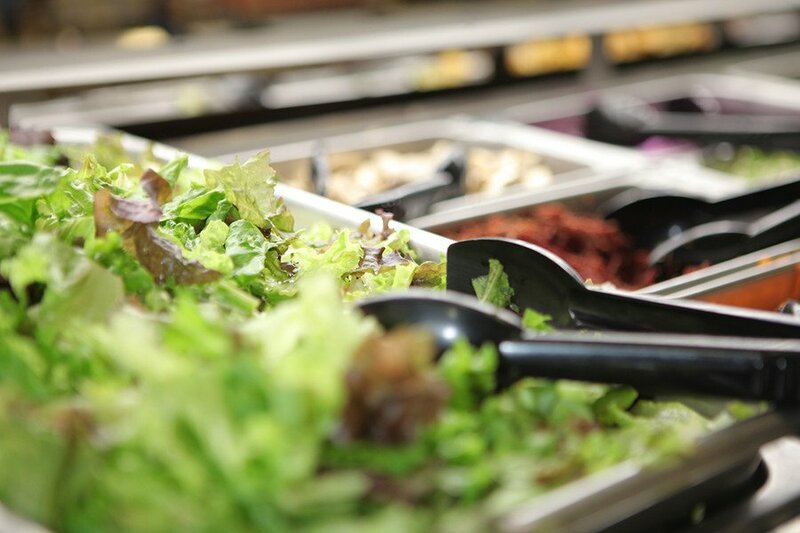 Our salad bar offers some of the most delicious, unique salad bar items in all of Hawaii! From everyday favorites, such as homemade cole slaw and potato salad to more “exotic” items, such as our great tasting and nutritious Quinoa Kale salad, you’ll be amazed at the delicious variety of fresh salads you have to choose from. You’ll love our famous Mock-Chicken Tofu Salad, our Okinawa Sweet Potato salad (a purple powerhouse of nutrition!) and our delicious Tofu-Nori Wraps …Mmm! Top off your salad with one of our tasty homemade dressings, including Green Goddess, creamy Tofu Tahini, and our popular Papaya Seed. Great tasting and great for you!